Its brightness, with a transmission score of 1.7 T-stop, means the lens’ aperture is closer to f/1.7. This will allow for great low light shooting. Controlling chromatic aberration. Photographers won’t frequently run into color fringing problems, the defect that displays unwanted colors at edges where dark and bright contrast meet. Containing distortion, a common strength of prime standard lenses. Limiting vignetting or lens shading, with the defect largely absent at apertures f/1.8 and above. • Resolution, with a score of 44 lp/mm, the lens performed so-so on an APS-C camera body. Sharpness was quite weak at the widest aperture of f/1.4. It reached its optimization at around f/2.8, but still struggled to obtain sharpness at the edges and corners of an image. • Its cost. At $640 (USD), the price tag for the Pentax smc DA Star 55mm f/1.4 SDM runs higher than most lenses with similar specifications. 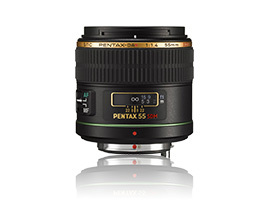 Pentax manufactures a number of lenses similar to the smc DA Star 55mm f/1.4 SDM, including the smc FA 50mm f/1.4. Like Pentax’s 55mm f/1.4 SDM, the Pentax 50mm f/1.4 also has wide aperture options, providing photographers advantages in low light environments and the ability to snap photos with a very shallow depth of field. Its price. Costing $450, it is nearly $200 less than its 55mm f/1.4 family member. Its lightweight and compact build, weighing 220 grams and measuring just shy of 4 centimeters in length, makes it an ideal lens for photographers on the go. Its quick autofocus motor, making it easier to catch moving subjects. Its circular aperture, which aids in creating better and more pronounced bokeh. Good control of chromatic aberration. It manages to keep this defect in check in the center, edges, and corners of an image. Pentax’s smc DA Star 55mm f/1.4 SDM, left, does an excellent job containing chromatic aberration. It even manages to keep this defect in check throughout an entire image. So how does Pentax’s smc DA Star 55mm f/1.4 SDM compare to products made by crosstown rivals Canon and Nikon ? The optics of the Pentax smc DA Star 55mm f/1.4 SDM manages to hold its own with the titans of the camera industry, including Nikon’s AF-S Nikkor 50mm f/1.4G and Canon’s EF 50mm f/1.4 USM. All three lenses were close in brightness, and the trio were near equals in controlling distortion and lens shading. However, the Pentax smc DA Star 55mm f/1.4 SDM was weighed down in one important category. Pentax’s 55mm f/1.4 SDM score was bogged down by its resolution, especially at the widest aperture of f/1.4. However, the three lenses came close to equalizing around aperture f/2.8. At smaller apertures, the Nikon 50mm f/1.4G and Canon 50mm f/1.4 USM began to again separate themselves against Pentax’s 55mm f/1.4 SDM with better resolution quality. Its affordable price, costing just under $450 (USD). Good resolution, especially between apertures f/4-f/8. Lightest out of the bunch, weighing a dainty 280 grams. Its extreme value, priced at the bargain rate of $385 (USD). Its sharpness, especially at middle aperture settings. Most compact, measuring just over 5 centimeters in length. Its control of chromatic aberration. It bested Canon and Nikon at tapping down this unwanted defect. The Pentax smc DA Star 55mm f/1.4 SDM is a quality lens capable of producing quality images – it would be particularly well suited for portrait photographers who can use the lens’ extremely high aperture to produce compelling and dramatic images. But the lens is not for everyone, especially Pentax users who are on a budget. Fortunately, the camera maker has lower priced alternative lenses capable of creating images with similar results.